I first reached out to poet Tara Betts in January 2014, when she was un-inked. A few months later, she was taking pictures of tattooed poets at AWP, and sending them my way. Michael Mlekoday, one of those poets, appeared earlier this month here. But, lo and behold, between last year's AWP and this year's installment of the Tattooed Poets Project, Tara went and got her first tattoo! And she went for big and spectacular! This is "won't you celebrate with me," one of Clifton's best-loved poems. 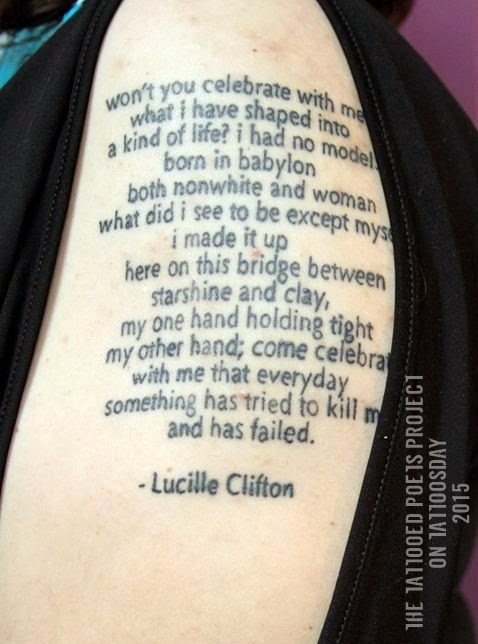 "I chose Ms. Clifton's 'won't you celebrate with me' because she was one of my first poetry teachers, and this poem reminds me of how some days let you know that ensuring your existence is an act of resistance. I told her daughter Alexia that I would get this tattoo, and I am glad that I did. This poem is an affirmation for me." I first remember hearing Lucille Clifton read this poem on Bill Moyers' Language of Life special in the 1990s. I had the pleasure of hearing her read it on one occasion at the Geraldine Dodge Poetry Festival in the last decade. I still get chills when I hear this poem. Tara sent us the following poem, "Ink on the Sheets," from her new manuscript "Break the Habit:"
to your sheets always creates a moment of regret. sheets flush with curlicues of white and pink leaves. for comfort yet practical for sweat and tangling. on a bed frame, springs, and cotton. Tara Betts is the author of Arc & Hue and the chapbook/libretto THE GREATEST! : An Homage to Muhammad Ali. Tara received her Ph.D. in English/Creative Writing at Binghamton University. Her poems has appeared in numerous journals and anthologies, including POETRY, Ninth Letter, Crab Orchard Review, Gathering Ground, Bum Rush the Page, Villanelles, both Spoken Word Revolution anthologies, The BreakBeat Poets, Octavia's Brood: Science Fiction Stories from Social Justice Movements, and GHOST FISHING: An Eco-Justice Poetry Anthology . She recently completed the manuscript for her second poetry collection "Break the Habit" and is working on other projects. 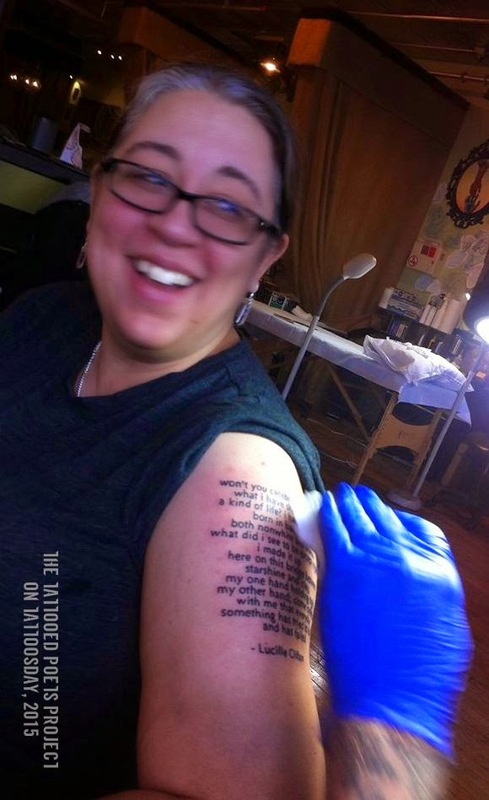 Thanks to Tara Betts for her amazing contribution and all the support she has lent Tattoosday and the Tattooed Poets Project over the last two years!